Your escrow and mortgage customers will find these folders extremely useful for each transaction. The folders include five different colored page inserts designed to be used with two-hole bracket fasteners. This is a great	way to show your customers you're working for them! This folder and the inserts are highly functional for a variety of uses. Keep track of property information, listing & selling offices and buyer & seller information. The inside cover has a file checklist and the back inside cover has a conversation log. The five preprinted tabbed inserts include: Purchase Agreements / Inspections & Disclosures / Escrow, Title, Insurance & Loan / Notes & Miscellaneous and Listing Agreement. 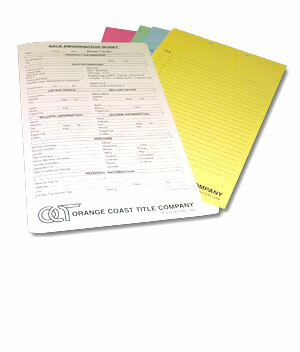 This legal size folder packs a lot of functionality for your customers while providing you with a great marketing tool! Also available with metal fasteners. Call for pricing.